For other uses, see Centipede (disambiguation). Their size can range from a few millimetres in the smaller lithobiomorphs and geophilomorphs to about 30 cm (12 in) in the largest scolopendromorphs. Centipedes can be found in a wide variety of environments. They normally have a drab coloration combining shades of brown and red. Cavernicolous (cave-dwelling) and subterranean species may lack pigmentation, and many tropical scolopendromorphs have bright aposematic colors. Worldwide, an estimated 8,000 species of centipedes are thought to exist, of which 3,000 have been described. Centipedes have a wide geographical range, where they even reach beyond the Arctic Circle. They are found in an array of terrestrial habitats from tropical rainforests to deserts. Within these habitats, centipedes require a moist microhabitat because they lack the waxy cuticle of insects and arachnids, therefore causing them to rapidly lose water. Accordingly, they are found in soil and leaf litter, under stones and dead wood, and inside logs. Centipedes are among the largest terrestrial invertebrate predators, and often contribute significantly to the invertebrate predatory biomass in terrestrial ecosystems. Centipedes have a rounded or flattened head, bearing a pair of antennae at the forward margin. They have a pair of elongated mandibles, and two pairs of maxillae. The first pair of maxillae form the lower lip, and bear short palps. The first pair of limbs stretch forward from the body to cover the remainder of the mouth. These limbs, or maxillipeds, end in sharp claws and include venom glands that help the animal to kill or paralyze its prey. Many species of centipedes lack eyes, but some possess a variable number of ocelli, which are sometimes clustered together to form true compound eyes. However, these eyes are only capable of discerning light and dark, and have no true vision. In some species, the first pair of legs at the head end of the centipede acts as sense organs similar to antennae, but unlike the antennae of most other animals, theirs point backwards. Unusual sense organs found in some groups are the organs of Tömösváry. These are located at the base of the antennae, and consist of a disc-like structure with a central pore surrounded by sensory cells. They are probably used for sensing vibrations, and may even provide a sense of hearing. Behind the head, the body consists of 15 or more segments. Most of the segments bear a single pair of legs, with the maxillipeds projecting forward from the first body segment, and the final two segments being small and legless. Each pair of legs is slightly longer than the pair immediately in front of it, ensuring that they do not overlap, so reducing the chance that they will collide with each other while moving swiftly. In extreme cases, the last pair of legs may be twice the length of the first pair. The final segment bears a telson and includes the openings of the reproductive organs. As predators, centipedes mainly use their antennae to seek out their prey. The digestive tract forms a simple tube, with digestive glands attached to the mouthparts. Like insects, centipedes breathe through a tracheal system, typically with a single opening, or spiracle on each body segment. They excrete waste through a single pair of malpighian tubules. Scolopendra gigantea, also known as the Amazonian giant centipede, is the largest existing species of centipede in the world, reaching over 30 cm (12 in) in length. 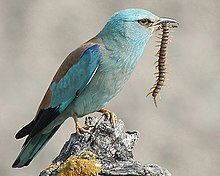 It is known to eat lizards, frogs, birds, mice, and even bats, catching them in midflight, as well as rodents and spiders. The Lithobiomorpha and Scutigeromorpha lay their eggs singly in holes in the soil, and the female fills the holes with soil and leaves them. The number of eggs laid ranges from about 10 to 50. Time of development of the embryo to hatching is highly variable and may take from one to a few months. Time of development to reproductive period is highly variable within and among species. For example, it can take 3 years for S. coleoptrata to achieve adulthood, whereas under the right conditions, lithobiomorph species may reach a reproductive period in 1 year. In addition, centipedes are relatively long-lived when compared to insects. For example, the European Lithobius forficatus may live for 5 to 6 years, and the wide-ranging Scolopendra subspinipes can live for over 10 years. The combination of a small number of eggs laid, long gestation period, and long time of development to reproduction has led authors to label lithobiomorph centipedes as K-selected. Little is known of the life history of the Craterostigmomorpha. The Craterostigmomorpha only have one phase of anamorphosis, with embryos having 12 pairs, and moultees 15. The clade Epimorpha, consisting of the orders Geophilomorpha and Scolopendromorpha, exhibits epimorphy: all pairs of legs are developed in the embryonic stages, and offspring do not develop more legs between moults. 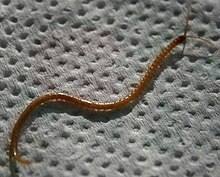 This clade contains the longest centipedes; the maximum number of thoracic segments may also vary intraspecifically, often on a geographical basis; in most cases, females bear more legs than males. The number of leg-bearing segments varies widely, from 15 to 191, but the developmental mode of their creation means they are always added in pairs—hence the total number of pairs is always odd. Scolopendromorphs, given their size, are able to feed on vertebrates, in addition to invertebrates. They have been observed eating reptiles, amphibians, small mammals, bats, and birds. Springtails may provide a large proportion of lithobiomorph diets. Little is known about scutigeromorph or craterostigmomorph diets. All centipedes are potential intraguild predators. Centipedes and spiders may frequently prey on one another. Two species, Scolopendra cataracta and S. paradoxa are known to be amphibious and are believed to hunt aquatic or amphibious invertebrates. Centipede defences include their speed and venomous forcipules, as well as the secretion of defensive chemicals. Geophilomorph centipedes can secrete sticky substances that generate toxic hydrogen cyanide and benzoic acid from microscopic glands on their undersides. Similarly, lithobiomorph centipedes secrete a sticky substance from glands in the rear-most two pairs of legs. Water regulation is an important aspect of centipede ecology, since they lose water rapidly in dry conditions and are found in moist microhabitats. Water loss is a result of centipedes lacking a waxy covering of their exoskeleton and excreting waste nitrogen as ammonia, which requires extra water. Centipedes deal with water loss through a variety of adaptations. Geophilomorphs lose water less rapidly than lithobiomorphs, though they have a greater surface area to volume ratio. This may be because geophilomorphs have a more heavily sclerotized pleural membrane. Spiracle shape, size, and ability to constrict also have an influence on rate of water loss. In addition, the number and size of coxal pores may be variables affecting centipede water balance. Centipedes live in many different habitat types—forest, savannah, prairie, and desert, to name a few. Some geophilomorphs are adapted to littoral habitats, where they feed on barnacles. Species of all orders excluding the Craterostigmomorpha have adapted to caves. Centipede densities have been recorded as high as 600/m2 and biomass as high as 500 mg/m2 wet weight. Small geophilomorphs attain highest densities, followed by small lithobiomorphs. Large lithobiomorphs attain densities of 20/m2. One study of scolopendromorphs records Scolopendra morsitans in a Nigerian savannah at a density of 0.16/m2 and a biomass of 140 mg/m2 wet weight. 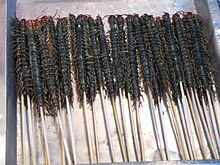 As a food item, certain large-sized centipedes are consumed in China, usually skewered and grilled or deep fried. They are often seen in street vendor's stalls in large cities, including Donghuamen and Wangfujing markets in Beijing. Also in China, as well as in Laos, Thailand, and Cambodia, large centipedes are kept in liquor for a period of time. This custom is allegedly part of the traditional Chinese medicine. Said to have medicinal properties and to be reinvigorating, the liquor with the centipede submerged in it is consumed as a special drink. Some species of centipedes can be hazardous to humans because of their bite. Although a bite to an adult human is usually very painful and may cause severe swelling, chills, fever, and weakness, it is unlikely to be fatal. Bites can be dangerous to small children and those with allergies to bee stings. The venomous bite of larger centipedes can induce anaphylactic shock in such people. Smaller centipedes are generally incapable of piercing human skin. 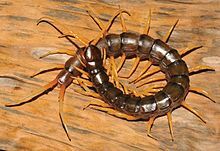 Even nonvenomous centipedes are considered frightening by humans due to their dozens of legs moving at the same time and their tendency to dart swiftly out of the darkness towards one's feet. A 19th-century Tibetan poet warned his fellow Buddhists, "if you enjoy frightening others, you will be reborn as a centipede." The upper three groups form the paraphyletic Anamorpha. The fossil record of centipedes extends back to 430 million years ago, during the Late Silurian. They belong to the subphylum Myriapoda which includes Diplopoda, Symphyla, and Pauropoda. The oldest known fossil land animal, Pneumodesmus newmani, is a myriapod. Being among the earliest terrestrial animals, centipedes were one of the first to fill a fundamental niche as ground level generalist predators in detrital food webs. Today, centipedes are abundant and exist in many harsh habitats. 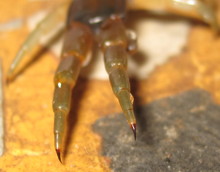 The first postcephalic appendage is modified to venom claws. The embryonic cuticle on second maxilliped has an egg tooth. The trochanter–prefemur joint is fixed. A spiral ridge occurs on the nucleus of the spermatozoon. The Chilopoda are then split into two clades: the Notostigmophora including the Scutigeromorpha and the Pleurostigmophora including the other four orders. The main difference is that the Notostigmomorpha have their spiracles located mid-dorsally. It was previously believed that Chilopoda was split into Anamorpha (Lithobiomorpha and Scutigeromorpha) and Epimorpha (Geophilomorpha and Scolopendromorpha), based on developmental modes, with the relationship of the Craterostigmomorpha being uncertain. Recent phylogenetic analyses using combined molecular and morphological characters supports the previous phylogeny. The Epimorpha still exist as a monophyletic group within the Pleurostigmophora, but the Anamorpha are paraphyletic. Geophilomorph centipedes have been used to argue for the developmental constraint of evolution; that the evolvability of a trait, the number of segments in the case of geophilomorph centipedes, was constrained by the mode of development. The geophilomorph centipedes have variable segment numbers within species, yet as with all centipedes, they always have an odd number of pairs of legs. In this taxon, the number of segments ranges from 27 to 191, but is never an even number. The Scutigeromorpha are anamorphic, reaching 15 leg-bearing segments in length. Also known as house centipedes, they are very fast creatures, and able to withstand falling at great speed: they reach up to 15 body lengths per second when dropped, surviving the fall. They are the only centipede group to retain their original compound eyes, within which a crystalline layer analogous to that seen in chelicerates and insects can be observed. They also bear long and multi-segmented antennae. Adaptation to a burrowing lifestyle has led to the degeneration of compound eyes in other orders; this feature is of great use in phylogenetic analysis. The group is the sole extant representative of the Notostigmomorpha, defined by having a single spiracle opening at the posterior of each dorsal plate. The more derived groups bear a plurality of spiracular openings on their sides, and are termed the Pleurostigmomorpha. Some even have several unpaired spiracles that can be found along the mid-dorsal line and closer to their posterior section of tergites. There are three families: Pselliodidae, Scutigeridae and Scutigerinidae. Pselliodidae includes just a few species in the genus Sphendononema (=Pselliodes), occurring in the Neotropics and tropical Africa. Scutigerinidae, composed of three species in the genus Scutigerina, is restricted to southern Africa and Madagascar. Most scutigeromorphs from other parts of the world belong to the Scutigeridae, which includes two subfamilies, the Scutigerinae and Thereuoneminae. The Lithobiomorpha, also known as stone centipedes, represent the other main group of anamorphic centipedes; they also reach a mature segment count of 15 trunk segments. This group has lost the compound eyes, and sometimes has no eyes altogether. Instead, its eyes have a single ocellus or a group of ocelli. Its spiracles are paired and can be found laterally. Every leg-bearing segment of this organism has a separate tergite, these alternating in length apart from a pair of long tergites on each of segments 7 and 8. It also has relatively short antennae and legs compared to the Scutigeromorpha. Two families are included, the Henicopidae and Lithobiidae. The Craterostigmomorpha are the least diverse centipede clade, comprising only two extant species, both in the genus Craterostigmus. Their geographic range is restricted to Tasmania and New Zealand. They have a distinct body plan; their anamorphosis comprises a single stage: in their first moult, they grow from having 12 segments to having 15. Their low diversity and intermediate position between the primitive anamorphic centipedes and the derived Epimorpha has led to them being likened to the platypus. They represent the survivors of a once diverse clade. Maternal brooding unites the Craterostigomomorpha with the Epimorpha into the clade Phylactometria. This trait is thought to be closely linked with the presence of sternal pores, which secrete sticky or noxious secretions, which mainly serve to repel predators and parasites. The presence of these pores on the Devonian Devonobius permits its inclusion in this clade, allowing its divergence to be dated to 375 (or more) million years ago. The Scolopendromorpha, also known as tropical centipedes, possess 21 or 23 body segments (apart from a single species, Scolopendropsis duplicata, which has 39 or 43 segments) with the same number of paired legs. Their antennae have 17 or more segments. The eyes have a fixed number of four ocelli on each side in the family Scolopendridae and one ocellus per side in the genus Mimops (family Mimopidae), but other families are blind. The order comprises the five families Cryptopidae, Scolopendridae, Mimopidae, Scolopocryptopidae, and Plutoniumidae. The only 2 known amphibious centipedes, Scolopendra cataracta and Scolopendra paradoxa belong to this order. The Geophilomorpha, commonly known as soil centipedes, bear upwards of 27 leg-bearing segments. They are eyeless and blind, and bear spiracles on all leg-bearing segments—in contrast to other groups, which usually bear them only on their 3rd, 5th, 8th, 10th, 12th, and 14th segments—a "mid-body break", accompanied by a change in tagmatic shape, occurring roughly at the interchange from odd to even segments. This group, the most diverse at 1260 species, also contains the largest and leggiest specimens at 27 or more pairs of legs. They also have 14–segmented antennae. The group includes at least seven families: Mecistocephalidae, Geophilidae (including the former Linotaeniidae, Dignathodontidae and Macronicophilidae), Oryidae, Himantariidae, Schendylidae (including the former Ballophilidae), Zelanophilidae, and Gonibregmatidae (including the former Neogeophilidae and Eriphantidae). ^ Lloyd, John (2006). The Book of General Ignorance. London: Bloomsbury House. p. 119. ISBN 978-0571273782. Retrieved June 10, 2014. ^ Arthur, W. (2002). "The interaction between developmental bias and natural selection from centipede segmentation to a general hypothesis". Heredity. 89 (4): 239–246. doi:10.1038/sj.hdy.6800139. PMID 12242638. ^ Arthur, Wallace; Chapman, Ariel D. (2005). "The centipede Strigamia maritima: what it can tell us about development and evolution of segmentation". BioEssays. 27 (6): 653–660. doi:10.1002/bies.20234. PMID 15892117. ^ a b c d e f g h Lewis, J. G. E. (2007). The Biology of Centipedes. Cambridge University Press. ISBN 978-0-521-03411-1. ^ Adis, Joachim; Harvey, Mark S. (2000). "How many Arachnida and Myriapoda are there worldwide and in Amazonia?". Studies on Neotropical Fauna and Environment. 35 (2): 139–141. doi:10.1076/0165-0521(200008)35:2;1-9;FT139. ^ a b c d e Barnes, Robert D. (1982). Invertebrate Zoology. Philadelphia, PA: Holt-Saunders International. pp. 810–816. ISBN 978-0-03-056747-6. ^ a b Fox, Richard (June 28, 2006). "Invertebrate Anatomy OnLine: Scutigera coleoptrata, house centipede". Lander University. Archived from the original on 2010-07-19. ^ Molinari, Jesús; Gutiérrez, Eliécer E.; de Ascenção, Antonio A.; Nassar, Jafet M.; Arends, Alexis; Márquez, Robert J. (2005). "Predation by giant centipedes, Scolopendra gigantea, on three species of bats in a Venezuelan cave" (PDF). Caribbean Journal of Science. 4 (2): 340–346. Archived from the original (PDF) on 2010-10-09. Retrieved 2011-02-20. ^ Lewis, J. G. E. (2006). The Biology of Centipedes. Cambridge University Press. p. 328. ISBN 9780521034111. Retrieved 2016-12-24. ^ Yates III, Julian R. (December 1992). "Scolopendra subspinipes (Leach)". University of Hawaii EXTension ENTOmology & UH-CTAHR Integrated Pest Management Program: Knowledge Master. Retrieved 2016-12-24. ^ Albert, A. M. (1979). "Chilopoda as part of the predatory macroarthropod fauna in forests: abundance, life-cycle, biomass, and metabolism". In Camatini, Marina (ed.). Myriapod biology. Academic Press. pp. 215–231. ISBN 978-0-12-155750-8. ^ Weil, Edmund (1958). "Zur Biologie der einheimischen Geophiliden" [On the biology of the native geophilids]. Zeitschrift für Angewandte Entomologie (in German). 42 (2): 173–209. doi:10.1111/j.1439-0418.1958.tb00889.x. ^ a b Holmes, O. (1 July 2016). "Giant swimming, venomous centipede discovered by accident in world-first". The Guardian. Retrieved 1 July 2016. ^ a b Pskhun (2018-09-24). "Species New to Science: [Chilopoda • 2018] Scolopendra paradoxa • A Phylogenetic Approach to the Philippines Endemic Centipedes of the Genus Scolopendra Linnaeus, 1758 (Scolopendromorpha, Scolopendridae), with the Description of A New Species". Species New to Science. Retrieved 2018-10-17. ^ Hölldobler, Bert; Wilson, Edward O. (1990). "The specialized predators". The Ants. Harvard University Press. pp. 557–572. ISBN 978-0-674-04075-5. ^ Einser, Thomas; Eisner, Maria; Siegler, Melody (2005). Secret weapons: defenses of insects, spiders, scorpions and other many-legged creatures. Cambridge, Massachusetts: The Belknap Press. pp. 33–36. ISBN 978-0-674-01882-2. ^ Lewis, J. G. E. (1961). "The life history and ecology of the littoral centipede Strigamia maritima (Leach)". Proceedings of the Zoological Society of London. 137 (2): 221–248. doi:10.1111/j.1469-7998.1961.tb05900.x. ^ Lewis, J. G. E. (1972). "The population density and biomass of the centipede S. amazonica (Bucherl) (Scolopendromorpha: Scolopendridae) in Sahel savannah in Nigeria". Entomologist's Monthly Magazine. 108: 16–18. ^ "101 Strangest Foods Around the World". Archived from the original on 2016-11-16. Retrieved 2015-06-28. ^ Bush, Sean P.; King, Bradley O.; Norris, Robert L.; Stockwell, Scott A. (2001). "Centipede envenomation". Wilderness & Environmental Medicine. 12 (2): 93–99. doi:10.1580/1080-6032(2001)012[0093:CE]2.0.CO;2. PMID 11434497. ^ Jacobs, Steven J. (19 October 2009). House Centipede (PDF). Pennsylvania State University. In 1902, C.L. 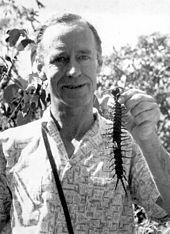 Marlatt, an entomologist with the United States Department of Agriculture writes in Circular #48 - The House Centipede: It may often be seen darting across floors with great speed, occasionally stopping suddenly and remaining absolutely motionless, presently to resume its rapid movements, often darting directly at residents, particularly women, evidently with a desire to conceal itself beneath their dresses, creating much consternation. ^ Zabs-Dkar Tshogs-Drug-Ran-Grol. The Life of Shabkar: The Autobiography of a Tibetan Yogin. Albany: SUNY Press, 1994. p. 295. ^ Shear, W. A. (1992). "Early life on land". American Scientist. 80: 444–456. ^ a b Edgecombe, G. D.; Giribet, G. (2002). "Myriapod phylogeny and the relationships of Chilopoda". In Bousquets, J. Llorente; Morrone, J. J. (eds.). Biodiversidad, Taxonomía y Biogeografia de Artrópodos de México: Hacia una Síntesis de su Conocimiento, Volumen III. Universidad Nacional Autónoma de México. pp. 143–168. ^ Minelli, Alessandro (2009). "Evolutionary developmental biology does not offer a significant challenge to the neo-Darwinian paradigm". In Ayala, Francisco J.; Arp, Robert (eds.). Contemporary Debates in Philosophy of Biology. John Wiley and Sons. pp. 213–226. ISBN 978-1-4051-5999-9. ^ a b Edgecombe, Gregory D.; Giribet, Gonzalo (2008). "A New Zealand species of the trans-Tasman centipede order Craterostigmomorpha (Arthropoda : Chilopoda) corroborated by molecular evidence". Invertebrate Systematics. 22: 1–15. doi:10.1071/IS07036. ^ Bates, M. (26 June 2016). "'Horrific' First Amphibious Centipede Discovered". National Geographic. Retrieved 1 July 2016. ^ Siriwut, W.; Edgecombe, G. D.; Sutcharit, C.; Tongkerd, P.; Panha, S. (2016). "A taxonomic review of the centipede genus Scolopendra Linnaeus, 1758 (Scolopendromorpha, Scolopendridae) in mainland Southeast Asia, with description of a new species from Laos". ZooKeys (590): 1–124. doi:10.3897/zookeys.590.7950. PMC 4926625. PMID 27408540. Wikisource has the text of the 1911 Encyclopædia Britannica article Centipede.